2016: Played 10 games with the Ottawa Redblacks…Registered 25 defensive tackles and one interception…Released by Ottawa on September 9…Signed as a free agent by the Tiger-Cats on September 20…Started four regular season games, one time at defensive back and three times at linebacker, for the Tiger-Cats…Recorded eight defensive tackles, one special teams tackle and one quarterback sack…Made his Tiger-Cats debut on October 14 vs. Ottawa. PLAYOFFS: Played in the Eastern Semi-Final on November 13 vs. Edmonton…Registered one defensive tackle, one special teams tackle, one tackle for loss, one forced fumble and recovered an onside punt. 2015: Played two games with Ottawa…Registered two defensive tackles and one pass knock down…Suffered a wrist injury on June 25 versus Montreal. PLAYOFFS: Recorded one defensive tackle in the East Final versus Hamilton…Posted three defensive tackles in the Grey Cup versus the Edmonton Eskimos. 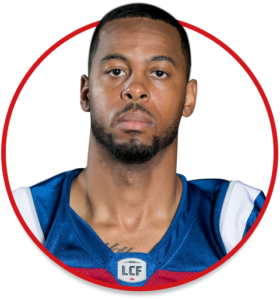 2014: Played five games with the Indoor Football League’s Sioux Falls Storm…Posted 31 total tackles, three tackles for loss, one forced fumble and three pass break ups…Signed as a free agent by Ottawa on March 17…Played 10 games with the Redblacks…Collected 21 defensive tackles and two pass knock downs. College: Played four seasons at the University of Toledo (2009-12)…Appeared in 46 career games with the Rockets…Registered 220 total tackles, four sacks, eight interceptions, 33 passes defended, four defensive touchdowns, five forced fumbles and one fumble recovery…Earned Mid-American Conference All-Star honours at free safety in 2012. Personal: Attended Brashear High School in Pittsburgh, Pennsylvania…Played quarterback and defensive back in high school…Named City League “Player of the Year” and first-team 4A all-state honoree on defense in senior year…Son of Jerome and Dinine Robinson…Majored in criminal justice at Toledo.